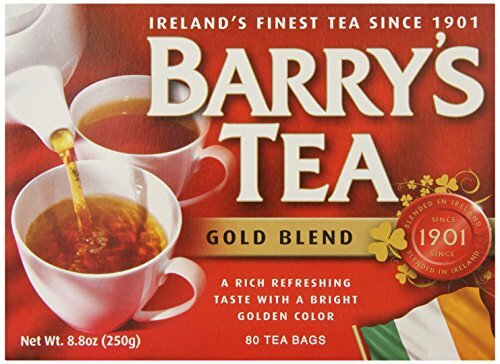 Barry’s Tea has its headquarters in Cork, Ireland and was founded in 1901 by James J. Barry. Quality has always been at the heart of this family business since the beginning and in 1934, Anthony Barry was awarded the Empire Cup of tea blending, cementing his expertise in the tea trade. This company sourced their tea mainly from India and Sri Lanka until the 1960’s and their blends were sold from their shop in Prince’s Street, Cork. They widened their distribution and wholesaling channels when their blends grew in popularity and began selling their teas in other stores throughout the country. Anthony Barry’s son Peter pioneered the concept of wholesaling tea in 1960 and began to source tea from East Africa, which resulted in an incredible reaction to their new blends. They soon learned that the freshness, flavor and quality of their tea made them a unique choice among tea enthusiasts. Thanks to word-of-mouth and loyal customers, their popularity and reputation grew. Barry’s Tea became a trusted, national brand by the 1980’s and they soon began to formulate their own fruit and herbal infusions, along with green teas, in answer to their customer’s demands for healthy choices. Throughout the years, this company’s Master Blenders never compromised their commitment to fine, quality tea. Their current Master Blender – Denis Daly – has been blending their teas for nearly 40 years, tasting three times a day to ensure the perfect cup every time. Accounting for 38% of all tea value sales in Ireland. Now employing 65 dedicated workers who strive to provide quality tea. Maintaining an online shop that has sold tea to over 60 countries in the last year. Garnering a distribution of 75% in the Greater North Eastern Region of the United States. Ensuring that 95% of their tea is bought directly through government agencies in East Africa. The reason for the above is due to those agencies’ representation of small farmers, helping them with fair pricing and ensuring the continued development of the local economies. Barry’s Tea also dominates the premium sector of the tea market, with Gold Blend as the market leader. Dedicated to ensuring that they never lose sight of their origins, this tea company is also driven to maintain sustainable business practices that support the communities they source their botanicals from. At the same time, they are committed to Ireland and their strong links with their local community, supporting many projects. Barry’s Tea always pays above the average price for their teas sourced from the farmers in the Kenyan tea industry and other regions. Organizations such as the Kenya Tea Development Authority and others in Uganda and Rwanda work hand in hand to pay farmers according to the quantity and quality of the tea they produce. The tea industry is among the top foreign exchange earners and the largest employer in these countries, which shows how important tea is to their local economies. This company visits the estates in Assam, India and Kenya and are consistently impressed by their excellent medical and housing facilities. Barry’s Tea is proud to advise that their contributions assist their suppliers with providing land and the opportunities to build schools for the children of the tea farmers. Also: Have you ever tried Jasmine tea? Becoming Rainforest Alliance Certified meant that this tea company was able to continue with their commitment to supporting sustainability and local communities. Their black tea product range is sourced from Rainforest Alliance Certified farms, which ensures the promotion of well-being for the workers, the communities and the environment. This company’s signature blends include Classic, Gold, Original and Decaf, passed down by their family’s generations and perfected throughout the years, continuing to provide quality products to their loyal customers. This famous, signature blend is sourced from the finest tea gardens in the Assam Valley of India, Kenya and Rwanda. Known as Ireland’s favorite tea, this rich, golden brew has a concentrated flavor that is nice and smooth, making it perfect for mornings. Bold and never bitter, this tea is delicious with or without milk and sugar. A herbal infusion that is considered to be the taste of summer, this blend is refreshing with the addition of red berries and a hint of elderberries, making it delicious as well as nutritious. This tea is caffeine and sugar free, with an aroma just as enticing as the taste of juicy berries, making it a sweet treat for any time of the day. A full-bodied and aromatic red blend that is rich, low in tannin and caffeine free. Made from the freshest leaves of the Redbush plant, sourced from the finest tea gardens of South Africa’s Western Cape, this is the ideal alternative to black tea and can be enjoyed hot or iced, with or without milk. Barry’s Tea offers products that have been honed through the ages by skilled Master Blenders, but there’s so much more on offer. With an interesting blog, Mindfulness podcast, tea inspired recipes and a Limited Edition blend, this company has learned to grow with the times while maintaining tradition and a focus on the future.